What is the intent of the flip book, and why do you want to get inside their emotions? BECAUSE, the anger and frustration is mostly contained at country club levels, much more apparent at public courses. Maybe the cc'er doesn't have the economic worries of the public, they can afford dues, whereas on the public links, it is expensive to play. Also, depends on if they are playing with other members, whom they know, and/or guests, who are often business targets. And, not all clubs operate alike, you have some very private, exclusive clubs, and others which are more open. So, my answer would probably be NO, I don't think it is true "most" of these guys are frustrated and angry...but it is the nature of the game to have momentary bits of both take place. As you well know Glenn, it goes to intent, and what you want the results of your stimulus to be, the reason for the flip book...whether it is to sell golf equipment or golf improvement, or if it has a different purpose. At the upper levels, you can't go wrong with Greed, cause that is a more permanent state of mind than temporary frustration over a "game", these guys want to WIN at LIFE...think Trump, you'll easily tap into all the emotion you need. PS. 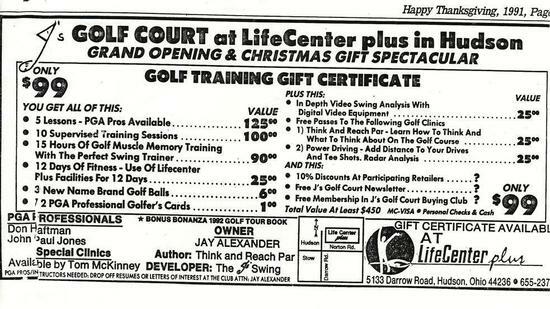 27 yeas ago this ad brought in over 20k worth of business, ran one time on Thanksgiving day, cost me 400 bux. If he teaches the game, maybe he'll get some ideas. Or not. Last edited by GordonJ : November 20, 2018 at 09:56 AM.